This is the first time I am buying a brand new car. 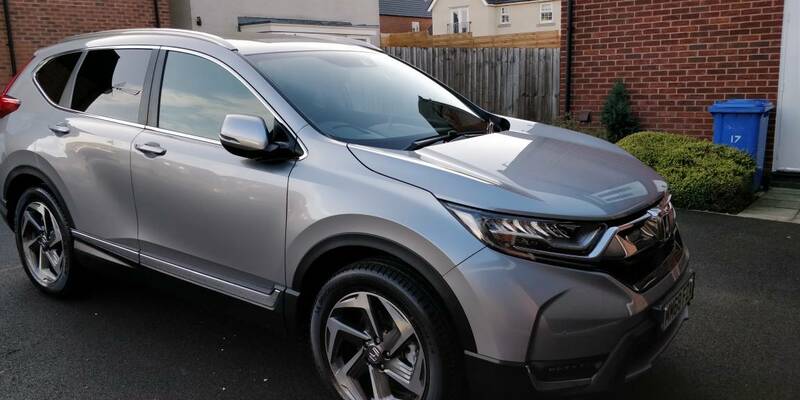 1.5 CR-V in lunar silver. Expected delivery next month. I am doing a part exchange. Please can I ask when do I get provided the registration plate details of the car, just so that I can arrange insurance for the new car. When do I get the logbook? Also the dealer (holdcroft) has suggested that I make the full payment 7 days in advance of the expected delivery date. That too through online transfer to Holdcroft Honda. Is that a normal practice? What protection do I have if the delivery gets delayed after making the payment or the dealer goes bust! It's a cash purchase. I don't know the specifics of the dates, but I do know that Honda will (should?) offer you a "5-day drive away" insurance cover note. It's their way of selling you an expensive insurance policy. You can always get a quote with an insurer using the make/model info and just finalise from quote to cover when you collect the car (that's what I did yesterday). Regarding payment, I know that the Honda sales documents say that they won't accept debit card payment of more than £2000 (they suggest bankers draft). But they will, as my local dealer gladly accepted my CC and Debit yesterday. They probably "suggested" it as they need to see cleared funds before they give you the car, and if they can't confirm your payment you will be "disappointed". You'll have no protection if they go bust, unless you use a credit card. As with all interactions with the dealer, ask them if it is "necessary". I would keep the cash in my account until the car is in front of me with no defects. Thank you very much for the very informative reply. Honda dealer had mentioned to me as well that they are limited in how much they can accept by debit card, although my bank suggested that there is no limit. The Honda dealer did not mention about the drive away insurance, nor did they mention about the choice of registration plates. I have not had any updates from them since placing the order, I was told that the car may arrive before the expected date of delivery which is 7th December. I am doing a part exchange, so I will get my current insurer to cover me for both cars on the day of collection, and then transfer over the policy on to the new car. I assume that the Honda insurance is not free then? I assume that the Honda insurance is not free then? The 5-day cover they provide is free (paid for by the dealer/insurer), but if you want to extend it to a full 1-year policy you have to pay. In my case the Honda quote was double my Aviva quote, and that was without a newly qualified driver on the policy. I guess they hope that some buyers will be cash rich, time poor and just pay for the Honda quote. I fully expect a barrage of sales phone calls from Honda insurance over the coming days! Took delivery of the car this Friday. 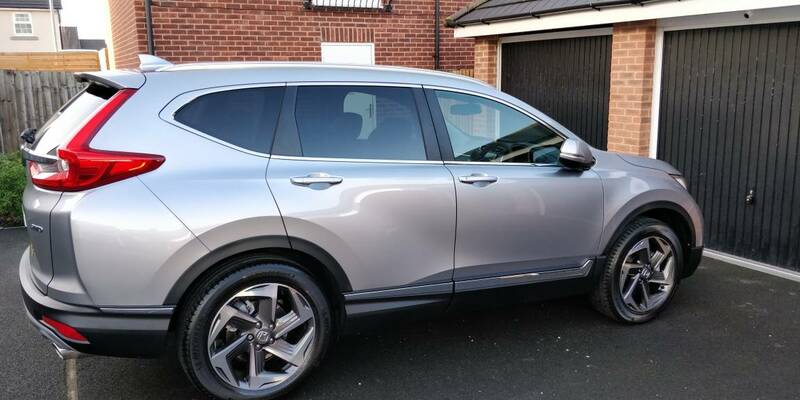 The handover went smoothly, the car was registered at the time of the handover, and showed up on the DVLA database the next day. My insurer provided me cover for the part exchange, and cover for the CR-V for the remainder of the term. The dealership accepted that there were communication issues, and apologized for the experience. Still getting used to the features. Bit of turbo lag, power in the manual transmission down to 172hp, so not very fast as it weighs approximately 1600kg. Took it for a drive on the motorway today, all wheel drive was on even at cruising speeds, I thought it switched to 2 wheel drive automatically at cruising speeds. Family happy as plenty of space in the car, this was the main reason we didn't go for the civic. Interior very well appointed. Thank you all for the valuable advice. [H]onda, exhausted and Farqui like this. Those wheels, damn. Wouldnt mind them on my Civic! I simply can not understand why some reviewers hate the look of the car. Went from a FN2 to the RW2 in November as well! Car is great, feels stronger than 173hp. Got the SE-equivalent trim (called elegance in Greece) for 31900GBP. That is SR money in the UK but taxation here is quite heavy on vehicles. Car weighs 1585kg at full tank. Im already looking into modding it. I swapped out the mufflers for custom ones and I am going to order the PRL SRI street MAF. It is not a straight fit but will be installed without any serious modding. Ktuner/Hondata have not jailbroken the ECU yet, I will go for a v1.2 and help them sort it out. Any chance for you to check your ECU part number? Mine is 37820-5ST-G05. I am curious about the part numbers range the manuals have. I have been searching online for a recent Honda EPC for Europe but have found nothing. In the US, Honda is much more open with their parts catalogue and you can find all OEM parts numbers. 27WON have a nice drop-in turbo, problem is that the clutch cant handle it. I was looking into figuring out if the USDM civic Si has the same clutch but I havent found out yet. The clutch will be an issue. The engine can definitely handle another 100hp more or less without issue and the 2piston calipers are nice to have since Honda were not known to use bigger brakes until FK2 and FK8. Installed the Honda Access front spoiler, side lower decorations in body color and rear decoration also factory painted, all NH883P. Lastly, got myself the Mugen grill from Hendy performance! FMIC-wise, the Mishimoto destined for the civic is a good choice as it can utilize the stock piping but there is a good chance that the active grill shutters need to be removed. The mounting points also are a bit narrower on the IC, but it can be sorted out with a bit of retrofitting. I am looking into that as well. Those 19s are from top trim if I am not mistaken, but I didnt see yours having a sunroof. Did you got them as an accessory? I am trying to source them but they are way too expensive as new, they are not worth it. I am confident that 19s will help with the steering wheel feel. Stock wheels are 18x7.5/19x7.5 5x114.3 CB64.1 ET45 btw for anyone interested swapping out their rims. The Honda Sensing features are truly awesome and the car in general is amazing, actually love the fact that the AWD is working all the time and all the car needs is a stronger clutch and SMF to run at least 270hp without reliability issues. The 5th gen V is definately much more sporty from what Honda markets it and an official "sport" version like the HRV is getting should be available from the get-go. I used to own the 1st, 2nd and 3rd gen CRVs and this is better in every aspect. Still miss my FN2 and EP3s though...! Pitty they dont have it as a manual in the USA, solutions would have been found by now. Last edited by Anger; 6th April 2019 at 08:45. Sorry I do not have much technical knowledge about ECU etc. Please post some pictures of your mods. The model I have is called the EX in the UK, it has a panoramic sunroof factory installed. This is the highest trim available here. The AWD works all the time, I was under the impression that it would engage only if required to save fuel. It's sending torque to all the wheels all the time, I don't understand why. The best mpg I have got is 37mpg (British gallons) on a long motorway run with a light foot. With mixed daily commute driving 75% being motorway I get at the most 35mpg, usually less. I measure mileage from a full tank to full tank, the trip automatically resets on every refuel. I have been having a lot of trouble with the audio screen capacitative buttons going crazy and system becoming unresponsive. This problem is widespread in the US in the same Mitsubishi manufactured units. Honda does not have a solution yet. Dealership does not like warranty work. I will post some links. You have to exit the motorway, switch off the car and then switch back on. Honda should have gone for the Asian spec sound system with the bigger screen and separate climate controls. Hello, unfortunally the forum does not allow me to post my fotos, I guess I do not have enough posts. Will do so when I am allowed. I have posted them on my instagram account (anger2244). You do have the roof then, couldnt tell from the pics. The EX costed about 40000GBP here, so I prefered to go for a lower trim and spend the rest of the money in modding! I only miss the 19"s, sunroof and the blindspot indicators to be honest, dont really mind about the HUD or the leather upholstery or the power tailgate. I figured I can install the wheels myself, either aftermarket ones or OEM used. Still impossible to source used 19"s as the car is really new. The Honda Sensing features are awesome as well. The LKAS is a dream to have when cruising on highways. Never got volunterally the CBMS to work, I even thought that the car is malfunctioning and would not apply the brakes when needed. I got the dash warning, but the brakes never applied when I tried to test it out. Turns out I was too scared to actually run a proper test, as only yesterday as I was driving, 2 m*rons decided to J walk in a 40 meters distance as I was going about 40mph. The car applied the brakes briefly, not way too hard so the car following me wasnt too surprised. I actually loved it. I also really like the active seatbelts . Remember that all these systems are there to assist, not to substitute actual driving! It is just that when they operate, I feel like there is a safety net in case I miss something. Also, when I applied the brakes heavily coming to a traffic light and I reached for the hazard lights by instinct, they were already flashing! Regarding mileage, I get 38-40 mpg when cruising on the highway at 75-80 mph with ECON on. For heavy city/traffic I make around 30 mpg with the start/stop system engaged. I get lower mpgs obviously but only when I get a really heavy foot! I am not sure I got your kind of issue with the HU, but I imagine it is the similar problem I got with mine. What happened was the brightness of the screen started going up and down rapidly, without obvious reason. The screen was totally unresponsive. I had to pull over, turn the car off and then on, but the problem reappeared after a few minutes. This happened 2 or 3 times for two consecutive days and then it stopped. Never have had it again. I had around 6000 miles on the clock. So far no other issue and the problem did not re-appear. I only asked the dealer if an update for the HU was out but the reply was negative. In the USA, some had the same issue but I havent read about any kind of solution. Some had the HU replaced but I want to avoid that. I want to do the hondahack but this bug has put me off. Will do it eventually when I install Ktuner. Bear in mind that the Ktuner is a must-have mod but a custom tune is highly recommended especially for our vehicles since the manual isnt sold in the USA so there is no guaranteed base map for us. Boost increases, the engine is significantly more responsive plus we get to have the "normal mode" when the ECON button is pressed! I got myself an ELM module and the torque-pro app to monitor IATs to compare the stock airbox to the SRI when it is installed. The temps will obviously rise, I just want to see by what margin. I do not drive the car in heavy traffic too often, so I am not that worried. Plus the SRI makes an amazing noise, you can really here the turbo spool! I am using Mobil 1 0w-30 oil, with my driving the system tells me that I need to change oil every 6 months or so! I did not have any oil dilution issues like the Americans complain about. I checked the oil once, the level was just fine. As I did with my previous Hondas (including the Rs), I wait for 1 minute before driving off and then go easy for the first 10 minutes or more, depending on ambient temperature. The ECU number is tricky to see, you need to use your cellphones flashlight, is on the left side of the ECU, which is positioned vertically in front of the battery. Last edited by Anger; 8th April 2019 at 08:01.